New 2012 21′ Frontier and 150 HP 4-stroke Yamaha. The captains choice because of its versatility. 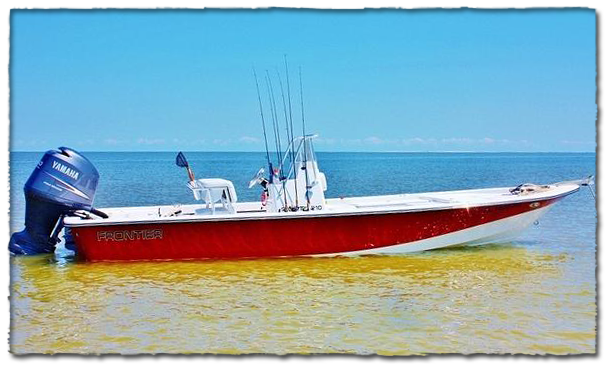 Makes it great for drafting shallow water for casting over grass flats and oyster bars but durable enough for fishing deeper waters in bays an outside beaches. Center console allows walk around room with plenty of dry storage and open deck space. Two comfortable seats in back can be folded down and hidden when not in use. Two live wells for bait and fish. Boat is fully equipped with life jackets, throw cushion, first aid kit and more to meet coast guard standards. Ice chest with ice for client beverages. Comfortable seating available for 6 passengers for eco tours.